Founded 18 years ago by brothers Mohsin & Zuber Issa, Euro Garages are now the fastest growing independent petrol station chain in the UK. Boasting a portfolio of 341 sites, Euro Garages are also one of the most recognisable brands in forecourt operations. Currently there are 104 Euro Garages/Greggs outlets, however with demand for retail offerings at petrol sites increasing, Euro Garages have looked to utilize the specialist experience of Rapid Retail. 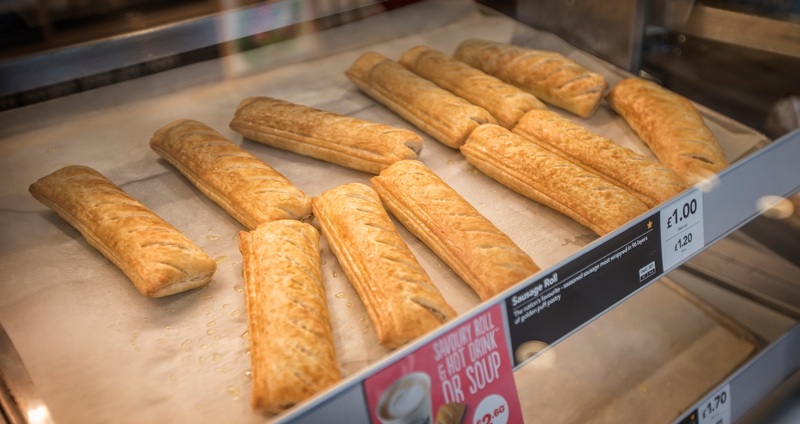 In early 2018 Rapid Retail in partnership with Newspace, were tasked with manufacturing a bespoke Greggs outlet for a Euro garages site located in Kinmel Bay, North Wales. Fashioned from two 12mx 3m steel units, our Euro Garages/ Greggs Modular Retail Shop is a perfect example of what we can produce on a large scale. Let’s begin with the exterior- Visually this unit does not differ from what you see on the high street, from bespoke signage to custom paint work, this unit is instantly recognisable by any member of the public. In terms of the design- We wanted to encompass light and space into this build, this was achieved via the bespoke glass work presented near the entrance. In terms of the interior- Rapid Retails innovative storage solutions effectively makes use of the limited internal space. The Features of this unit include: Wood affect Non-slip Vinyl Floor, Wall Mounted Displays & Built-in Refrigeration.